Film and television have helped to change attitudes toward gender and clothing styles. 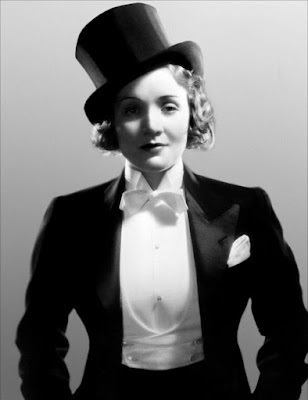 In the 1930s to the 1950s film became the vehicle for a form of feminine exhibitionism sparked by Marlene Dietrich in The Blue Angle. Even today a glimpse of her in top hat, tightly-fitting tail-coat, high heels, huskily singing "Falling In Love Again", opens up a whole world of eroticism and fetishistic modes of dress for a new generation of admires. Other examples abound, especially in the androgynous years of the eighties: Annie Lennox concert, with her short hair, classic man's suit and hat, and a red bra; the young, Grace Jones as a machine-man with her blockhead hairdo, muscular body and a very cool look. The androgynous images of these stars shift and blur the traditional gender boundaries between the sexes was everywhere. Although pop music has always tended to transgress traditional sexual values, the crossing of gender boundaries is more recent. Bowie's innovative songs and stagecraft brought a new dimension to popular music creating the genre sometime called glam rock. Shakespeare used cross-dressing for a good reason. It allows for disguise and deceit, seductions and mistaken identities. "People who think guys getting done up in gals’ cloths is something new and unique overlook history. They do not realize that the immortal Shakespeare created his greatest feminine role, Juliet, knowing it would be portrayed - not by a woman - but by a man. For in the days of Elizabethan Theater a young man played all feminine roles and this custom prevailed until after the Reformation." For this reason, cross-dressers have always been loved by the entertainment industry. From the 'sweet transvestite from Transylvania' in the Rocky Horror Picture Show to Julie Andrews in Victor/Victoria, cross-dressers never fail to amuse and intrigue us. However, gender bending in cinema serves a deeper purpose than simple comedy. In Tootsie, Dustin Hoffman cross-dresses because it is the only way he can get an acting job. In Mrs. Doubtfire, Robin Williams dresses up as a woman to gain access to his children. Both films explore and illuminate the relationship between power and gender using costume to entertain. Marlene Dietrich & David Bowie "Just A Gigolo"